Whether you live in a hot, dry desert area or in the freezing arctic zone, the scientifically tested DAMPITS humidifier will protect your instrument against damage. The original humidifier for string instruments, DAMPIT has been protecting wood instruments for over 40 years. Invented and patented in 1966 by profesional violinist and composer, Ralph Hollander, the DAMPIT has protected the instruments of thousands of musicians worldwide. The DAMPIT is the most economical, efficient and time-tested system for keeping your instrument properly humidified. Other systems claim to maintain humidity levels but will not raise humidity under dry conditions. The DAMPIT does both which prevents cracks and restores damaged wood. Long-lasting and easy to use. The DAMPIT is made of the finest materials. With proper care your DAMPIT will give you years of good service without needing frequent replacement. Used for over 40 years by world-class musicians. Because of the unmatched reliability of the DAMPIT, musicians all over the world have trusted it to protect their precious instruments. The Story of the Little Dampit At six, Julia Narveson wanted a DAMPIT small enough for her violin. Unable to find one, her mother encouraged her to write a letter to the inventor of the DAMPIT, suggesting he consider manufacturing a "little DAMPIT for little violins". Hollander was so intrigued by the letter, that he wrote Julia asking for her help. Julia responded by sending Hollander a drawing of what the little DAMPIT might look like and he responded by making her one by hand. Shortly after, Hollander began to manufacture the little DAMPIT. 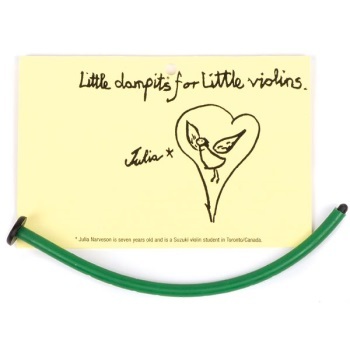 He asked Julia to create the lettering for the slogan "Little DAMPIT for Little Violins" and to do a drawing for the packaging. Three years later, Julia and Hollander met when he visited her in Canada to hear her perform in a Suzuki school recital. Julia's art work is still used today in the advertising materials. The Little DAMPIT is now distributed world-wide. Today, Julia lives in Montreal, plays a lot of music, and does illustrating.